A few days ago I happened upon this interesting Tag on Sandra’s Youtube channel and decide to give it a go, since I am definitely an Eyeshadow Junkie. The questions are quite simple and straightforward, so lets get on with it. 1) What is your favorite drugstore line of eyeshadow? My first answer to this would be the L’Oréal La Couleur Infallible pressed pigment eyeshadows because they are really incredible but unfortunately discontinued. So my next choice would be Sleek and Essence eyeshadows, for the great color selection, pigmentation and blendability. 2) What is your favorite eyeshadow primer? The only primer that works on my oily lids is the E.l.f. Eyelid primer from the basic line. I have tried many others over the years but this is the only one I can really count on. I always have a backup and usually order them in bulk from the website. 3) What is your first ever eyeshadow purchase and do you still use it? The first time I ever bought eyeshadow that I remember was in 2009, when I ordered online from Ebay this 120 eyeshadow palette by the brand Manly. I have used it a ton during the years from the wide range of shades available.The latest look I made with it is the first episode of the Paciugopedia (here) where I needed to use greens and purples, but now that I took it out again, that orange is calling me! 4) What is the best eyeshadow dupe you found? I have never really looked for eyeshadow dupes, but at some point I bought MAC Coppering and when I swatched it I realized I already had two really similar shades in my collections, Makeup Geek Roulette, which is slightly more brown, and Nabla Cosmetics Aphrodite that is even more pigmented and gorgeous! 5) Which is the most underrated eyeshadow? I think Kiko eyeshadows are underrated. I have bought a few palettes and single shadows from them and found some of my favorite shadows among them, like the Kiko Colour Impact eyeshadow palette (review here). An honorable mention also goes to the Kiko Water Eyeshadows (review here) which have the most amazing pigmentation and a huge variety of colors. 6) What are your favorite single shadows? This will come as no surprise when I say Makeup Geek matte eyeshadows, since I recenty swatched and reviewed them all on the blog (here). 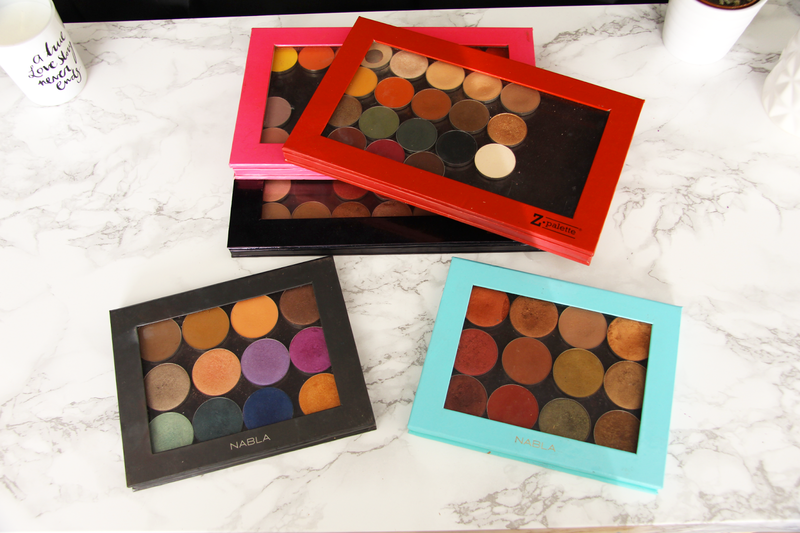 However, Nabla Cosmetics makes my favorite shimmer shadows, with the most amazing pigmentation and texture. 7) What is your favorite cream eyeshadow? This has to be Supreme by Nabla Cosmetics. It is the most gorgeous warm toned red I’ve found around. The consistency and lasting power are also excellent, so it ticks all the boxes for me. 8) What is your favorite neutral eyeshadow? After a long thought, I picked Mocha by Makeup Geek since I use it everyday for my eyebrows and in the outer V to deepen up any eye look. Love it! 9) What is your favorite colored eyeshdaow? Too much to choose from, I couldn’t narrow it down to just one. I already mentioned Nabla Supreme and Aphrodite and I will add Babylon and Atmosphere to that list. Finally, one shadow i found myself using a lot ever since I bought it is Makeup Geek Morocco, a gorgeous burnt orange that is the perfect crease color for any warm look. 10) What is the best eyeshadow palette ever? I wish there would be one palette that represents perfection for me. I love the Lorac Pro 1 and Pro 2, but in a daily basis the ones I reach for the most are my Z-Palettes with my Morphe and Makeup Geek shadows and the two Nabla Liberty Twelve. Lately I have started to put together my most used eyeshadow pans in a sort of “Life Palette” in the style of Katy’s of LustreLux but that is still a work in progress. So those were all questions of the Eyeshadow Junkie TAG! and of course all of you eyeshadow junkies who are reading!